Expert System Developed For Eaton Corporation By Mitchell Selling Dynamics, Inc. The objective of this Expert System is to allow users to select simple choices from available options and allow the computer to construct a drawing and create machining parameters for computer driven machines to manufacture the truck gear shift lever from a solid, straight piece of steel. This PC based version of the Lever Program runs out of Microsoft Access. This version (1.0) of the Program requires that Access 97 be installed on the Workstation computers that will use the program. LeverDat1.mdb contains the data used by the program and should be loaded onto an accessible directory on the Central Server that can be accessed by the Workstations over the local network. LeverFrm1.mdb contains all of the forms and code that the Users manipulate to design a Lever and display its features on both Screens and Printers. LeverFrm1.mdb should be loaded on to each Users Workstation computer. Ball End and Lever End graphical cells. Ball end cells are graphical images (Windows bitmap format) which are used to display the ball end forms on drawings. Ball end cells have the format "NCxxxx.bmp" and all should be loaded into a directory on the Server that can be accessed by the Workstations over the Network. Lever end cells are graphical images (Windows bitmap format) that display the lever threaded end shapes and dimensions. Lever end cells have the format "NVxxxx.bmp" and should be loaded into a directory on the Server that can be accessed by the Workstations. The Main Menu provides access to all of the features of the program. The Main Menu consists of a group of nine buttons as shown in the figure below. 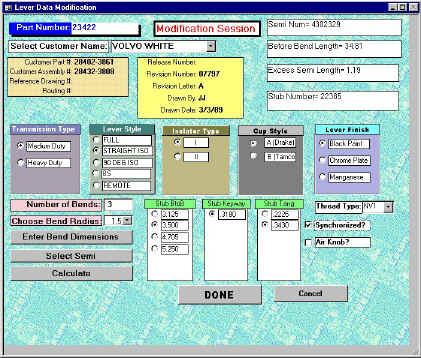 The customer information screen allows Eaton to store information about the customers company and the customers employees. There is additional information that can be stored and functionality that is helpful to Eaton to keep track of what is going on with the customer. 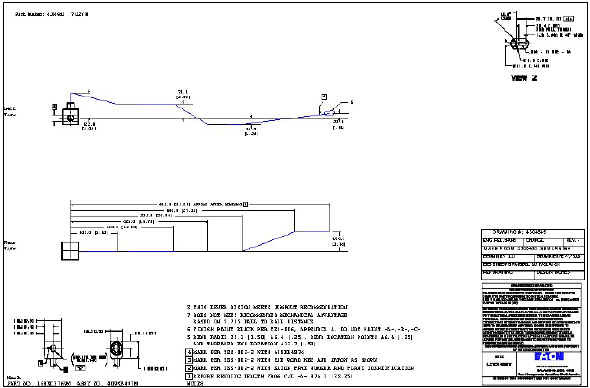 This screen shows the choices that can be selected by the user to allow the Expert System to construct the drawing and create the machining parameters. The Expert System uses the information from the selected options and constructs the drawing and creates the machining parameters. To view an Expert System on the internet click on the following link: Web Expert System. This type of Expert System involved over 500 hours of programming time and installation visits.